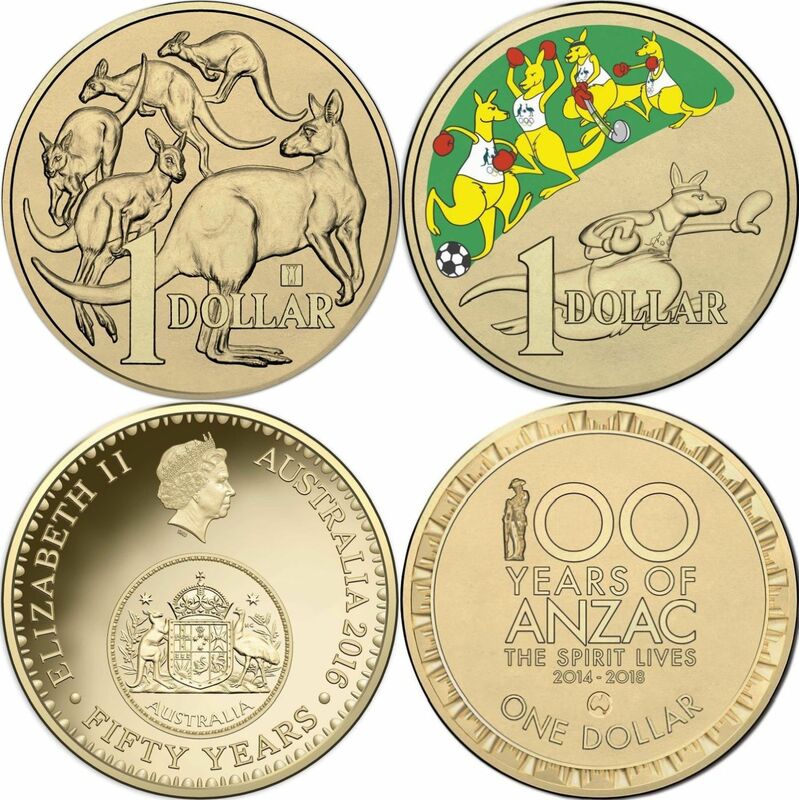 2016 Dollar Coins (images courtesy ramint.gov.au). Top left Mob of Roos Dollar with World Money Fair Buddy Bear Counterstamp, Top right Mob of Boxing Kangaroos, Bottom left 50th Anniversary of Decimal Currency Commemorative Obverse and Bottom right 100 Years of ANZAC Map Counterstamp. This is a list of all the 25 millimetre dollar coins issued by the Royal Australian Mint in 2016. It includes coins that were sent into circulation and collector coins of the same size. The list includes aluminium bronze dollar coins, silver coins and gold coins (if any). The silver and gold coins weigh differently but the standard dollar coin struck from aluminium bronze weighs 9 grams and each have interrupted edge milling. The obverses all feature the Ian Rank-Broadley portrait of Queen Elizabeth II. 2016 was a massive year for Australia’s coins celebrating 50 years of decimal currency. This 50th anniversary saw commemorative coins of all denominations including the dollar coin released with commemorative obverses instead of the usual special reverse. This commemorative obverse features a very small head of the monarch and a depiction of the Coat of Arms reverse seen on pre-decimal coins by George Kruger-Gray with the legends reading “FIFTY YEARS”. The reverse is the standard mob of roos design and this coin was issued into circulation. Also struck for circulation in 2016 was the mob of roos with the standard obverse and a commemorative 100 years of ANZAC dollar. The mintmark dollar for 2016 celebrated Australia’s first mints with the design depicting the gold sovereign. This was the gallery press coin which has been omitted from the annual report production statistics. For those following the lunar calendar the lunar series coin for 2016 celebrated the year of the monkey. Dollar collectors or now-ex dollar collectors continue to add (or not add) the plethora of alphabet dollars to their collections with this year the same as last with 2 types of coloured coins for each letter of the alphabet. We also saw the Mint release a fun mob of boxing kangaroos design for the Olympic Games in Rio. For items in our table that show a zero mintage this is because the number is unknown at this time or is unlimited. The numbers are correct up to and including the report for the 2016-17 financial year. More numbers will be added as new information becomes available.